Home / Posts tagged "Mold in Sippy Cup"
There are four conditions needed for mold growth: mold spores, temperature, moisture, and mold food. Mold spores are airborne and found everywhere in small amounts, and cups are typically stored at room temperature, so there’s not too much you can do to control those. The most effective ways to prevent mold from growing in your children’s cups is to properly clean them to reduce trace foods, and more importantly to eliminate all moisture after cleaning. 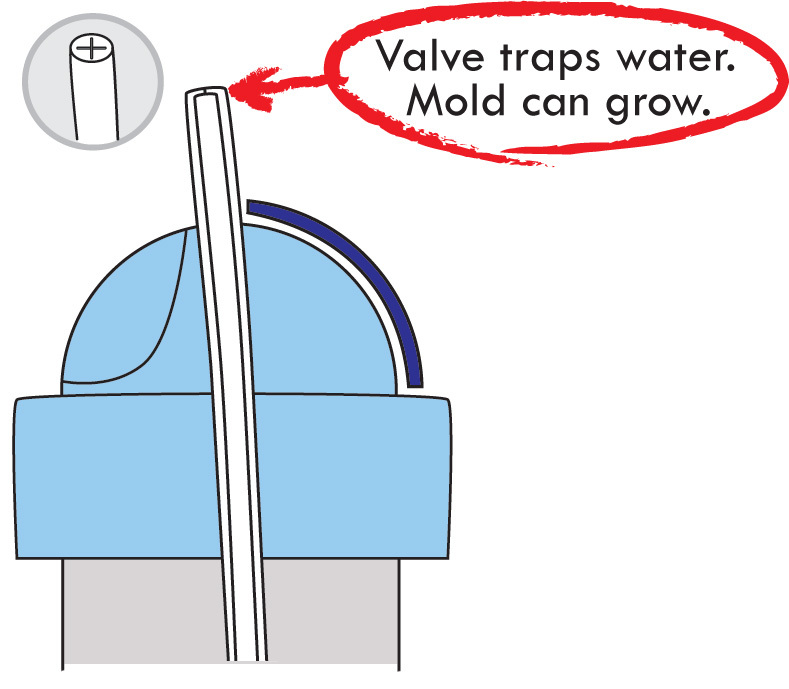 Straw valves trap water and food particles, and can harbor grime and mold. Travel valves slide to close the straw off to prevent leakage when stored in a bag for travel. Travel valves are often difficult to clean. They trap water and food particles, and can harbor grime and mold, and then transfer that to the straw they’re covering. Sippy cups are notorious for their tendency to harbor grime and mold, especially in straw valves and travel valves. These tips will help you get your children’s sippy cups cleaner and stop mold from growing. 1. Wash the cup immediately after each use. 2. FULLY disassemble the cup. Moisture and food collects in the joints between parts, and is exactly the type of place where mold can grow. Separate all straws, valves, rubber rings, plastic sliding covers, and so on. 3. Pre-rinse straws, valves, and other parts that collect food with warm water. Most rubber valves can be opened by pinching with your fingers. Pinch the valve and run water through it to pre-rinse. 4. Wash by hand in warm soapy water, or by dishwasher. 5. Shake out remaining water from all parts. 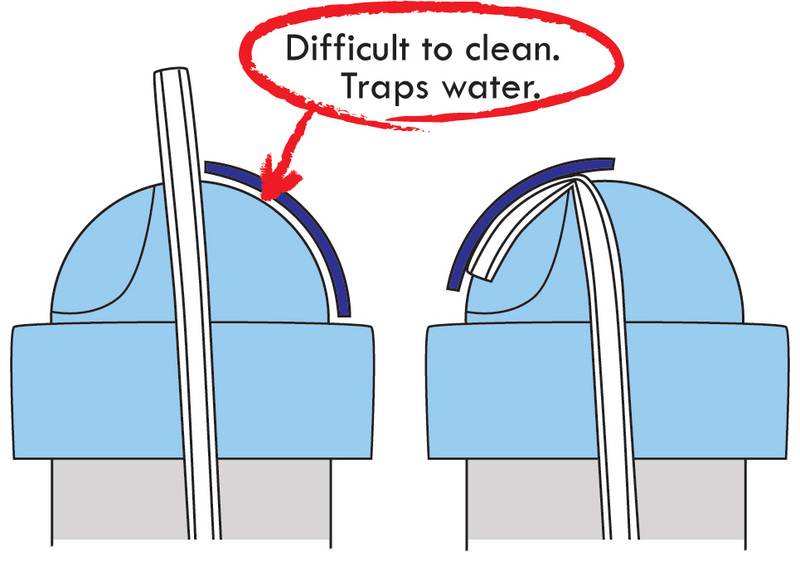 Shake out any water collected inside straws. If your cup or straw has a rubber valve, pinch it open while you shake to get the water out. 6. FULLY dry all parts before assembly. This is a key step, since moist parts won’t dry once assembled. Consider storing the cup disassembled, and assemble only when ready to use. 1. Use a straw brush to scrub inside straws. 2. Use a straw brush or a toothpick to scrub inside valves. a. Washing in a dishwasher will sanitize, and some hotter dishwasher cycles can even sterilize. The dishwasher is often the best solution for keeping your cups extra clean without exposing them to excessive temperatures and harsh chemicals that can deteriorate plastic, rubber, steel, and paint. b. A steam sterilizer is effective for killing mold. As with all methods, you must ensure that the parts are fully dried afterwards, so use the dry cycle if available. ii. Open windows when using bleach. Bleach is a chemical irritant. It can irritate the lungs and mucous membranes. In its concentrated form, it can damage skin, eyes and clothing. iii. Thoroughly rinse and dry all cup parts afterwards. d. A vinegar bath can help to clean grime, but isn’t effective enough to meet the technical definition of sterilization and will only kill about 70% of the mold. WIC and CSF Programs. USDA, Alexandria VA, March 2009. National Center for Environmental Health. Facts about Mold and Dampness. Center for Disease Control and Prevention, June 17, 2014. Retrieved December 7, 2015. Moisture and Mold Problems: Preventing and Solving Them in Your Home. WebMD, October 23, 2014. Retrieved December 7, 2015. Mold Growth, Assessment, and Remediation. Wikipedia, June 2014. Retrieved December 7, 2015. Rose, Bobbie. Sanitize Safely and Effectively: Bleach and Alternatives in Child Care Programs. California Childcare Health Program, October 2008.